That's when the car accident happens, and he wakes up in pain in a strange bed. But it isn't hospital. Annie Wilkes has pulled him from the wreck, brought him to her remote mountain home, splinted and set his mangled legs. The good news is that Annie was a nurse and has pain-killing drugs. The bad news is that she has long been Paul's Number One Fan. And when she finds out what Paul has done to Misery, she doesn't like it. She doesn't like it at all. 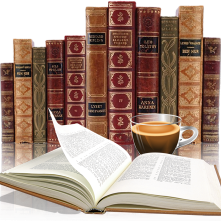 Tina over at Book Chatter has designated June 'Misery Read Along Month'. 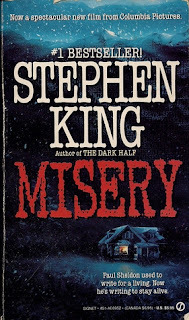 I haven't read Stephen King in ages, and thought to give it a whirl. The audio version was available from the library which I took as a sign and went for it. My husband thought I was nuts, more so when I invited him to watch the movie with me. Stephen King is a talented author, however I could count on one hand the number of his books that I have read. My son is reading and collecting his books which got me inspired to give him another try. HF is my usually genre, but sometimes you need a break from that, history doesn't always have that 'happy ever after' type of endings. But then again does Stephen King? Face is his books are rather creepy, sinister and downright scary (to be blunt). Someone asked me how the audio version was. Well it was almost like watching a bad accident in progress, you know what's going to happen and ya can't look away. That's exactly what Misery was like, I couldn't stop listening, I had to find out how this was going to end.. I listened to clues and hints as to what made Anne tick, what made her sweet one minute and deranged the next. 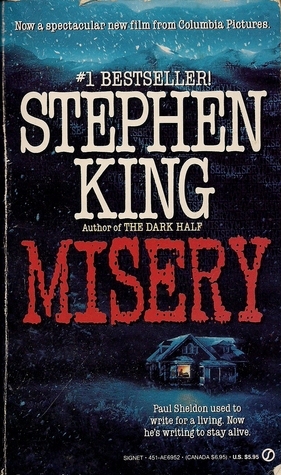 Hearing Paul's voice added the emotion and suspense that makes Stephen King's books what they are - hard-to-put down, creatively-unique and scary-beyond-reason, lol.